Say goodbye to long charging times. 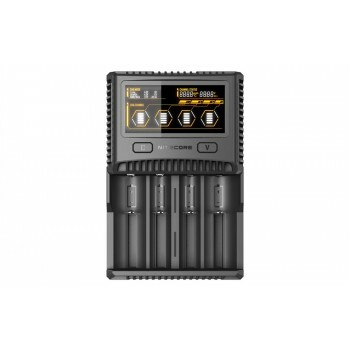 The NITECORE SC4 is capable of up to a blazing fast 3A speed in one slot and a system total charging output of 6A. This four-slot universal charger handles most IMR/Li-ion and NiMH battery types including 18650, 16340, 14500, 26650 and more. Equipped with a USB output as well, the SC4 can be used to charge external devices such as laptops and cell phones. Automatically identifies battery type and selects appropriate charging voltage and current. Capable of manually choosing charging voltage for LiFeP04 battery (3.7V) and Li-ion battery (4.35V). Automatically detects small capacity battery and selects appropriate charging current.